Don’t let cold and flu season keep you down this year. 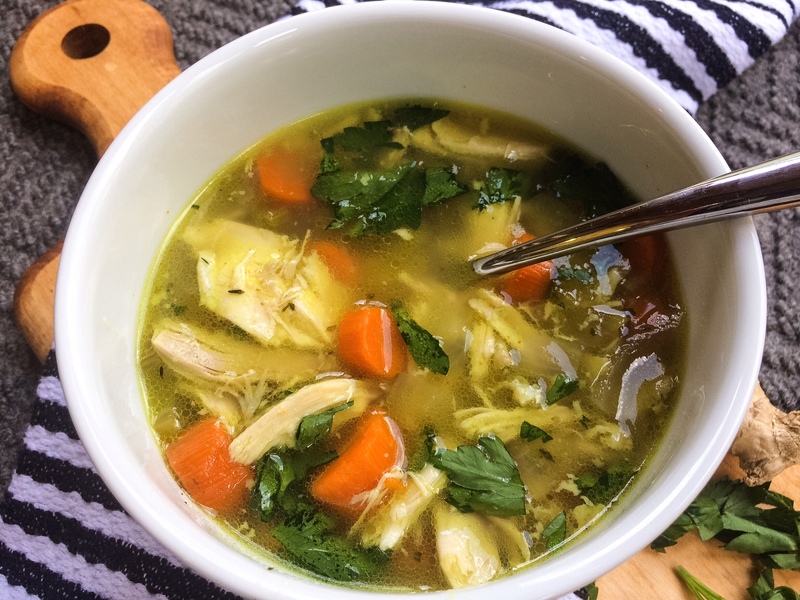 Start the season out prepared and armored up with this immune-boosting chicken soup. 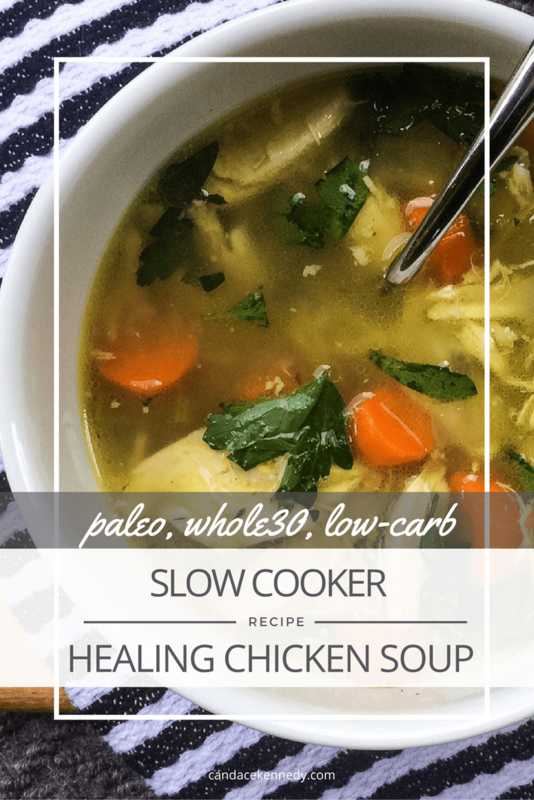 Chicken soup is full of minerals that support immune function. It can also help relieve sinus congestion and reduce cold symptoms. Garlic is a great source of vitamin B6 and C, manganese, selenium, potassium and copper. It has medicinal properties that can boost the immune system and increase general immunity. It also acts as an antibiotic, anti-fungal, and chemical detoxifier. Oregano can inhibit the growth of bacteria and has tremendous antioxidant activity. It contains thymol and carvacrol, two powerful antimicrobial agents. It can also aid in digestion and can help prevent gas. Thyme can help relieve lung congestion, whooping cough, and is a powerful antiseptic. It’s also antibacterial. Turmeric is a powerful anti-inflammatory and can help boost your immune system. It can also help relieve coughing and clear up mucus. Ginger is a potent antioxidant and anti-inflammatory, It’s also effective at boosting immunity and fighting off infection. Ginger contains the active component gingerols, and can help relieve nausea and aid digestion. Carrots are a great source of beta-carotene, powerful antioxidants that can lower inflammatory markers and stimulate white blood cell function. They are also a good source of vitamin C, a nutrient required by T cells and phagocytes to function. Coconut oil is antioxidant, anti-fungal, and anti-viral. It is loaded with MCTs, fatty acids that can be used immediately by the brain as fuel. It’s also a great source of fat. Onions are high in thiosulfinates, volatile sulfur compounds with therapeutic properties that aid in digestion, detoxification, and in lowering histamine. They are also good sources of antioxidant flavonoids, especially quercetin. Pro tip: Outsmart cold and flu season and make this soup ahead of time. I like to whip up a batch or two of this soup in early October and freeze it in individual servings. When I’ve been exposed to a bug, or someone in my household starts feeling sick, I just heat this soup up on the stovetop so we can all benefit from it without the hassle of cooking. No one likes to cook when they’re feeling sick! If you didn’t plan ahead, that’s not a problem too. This soup makes life easier since it’s a slow-cooker recipe. Just dump all the ingredients in your slow cooker, set the timer, and forget about it until it’s finished. You can also find more tips one what to eat when you’re sick in the post 8 Ways to Stay Healthy During Cold and Flu Season. And check out my Immune Boosting Shopping Guide for a look into how I keep my kitchen stocked to help ward off illness. Turn your slow cooker on low and add the coconut oil and ghee to the bottom of the cooker. Add the whole chicken to the slow-cooker, along with onion, garlic, carrot, celery, bay leaves, salt, pepper, turmeric, ACV, oregano, thyme, coconut aminos, ginger and cayenne pepper. Cover with water. Place the lid on the slow cooker and cook on low about 7-8 hours, until the chicken is cooked and falling off the bone. Remove the chicken from the pot (be careful! it’s hot and the chicken should be falling apart). Once the chicken has cooled enough, remove the meat from the bones. Add the chicken meat back to the soup and stir. When you’re ready to eat, add the chicken soup to a bowl and more minced garlic and chopped fresh parsley on top. When you’re ready to eat, add soup to a bowl and more minced garlic and chopped fresh parsley on top.